PV solar panels are a gift for humanity; not yet realised. Contrary to popular belief, PV solar panels in the UK produce electricity on most cloudy days. Amazingly, a system installed today will still be generating in three-decades time. PV (photovoltaic) cells produce electrons. Electrons will naturally gravitate to where they're earthed/needed. In a PV solar context, that may be battery storage, washing machine, TV or EV (electric vehicle) charging. The Inverter is fitted in the loft space with a modern wall-mounted display unit in your home to check your current/daily/monthly/annual performance figures. Photon particles do penetrate clouds allowing PV panels to generate power on some cloudy days too. 1.0 - 4.0 kW Monocrystalline. All our MCS installers are RECC members and work throughout England, Scotland and Wales. The Renewable Energy Consumer Code bring an ethical attitude to today's modern industry. "Unbelievably, photovoltaic solar panels from the 1960s are still generating electricity today." The combustion engine was the most significant machine developed by humanity, yet for most of its lifespan; lay dormant on the driveway. When in use, the rev counter varies from 1,000 to 6,000 RPM depending on road conditions and brings its owner a sense of pride (maybe) with its usefulness spanning a single decade or more. The same is true with photovoltaics. However, with battery storage, the usefulness continues beyond its initial operating time. While operational, the performance counter varies too depending on atmospheric conditions and also brings a sense of pride (maybe) with its usefulness spanning three decades or more. Enjoy nighttime freedom using battery storage. Today's battery storage devices in the UK market are tried and tested around the world. PV with battery storage is an additional option to benefit from your solar power 24/7. PV-to-hot water converters heat your hot water tank by diverting your sun-powered electricity toward your heating coil. This addition eliminates the need to use your boiler for a good proportion of the year. Adopting electric vehicle technology is an astute move, but powering your car with photovoltaics is genuinely genius - Real freedom with every petroleum-free mile. What happens to excess electricity produced? When a PV system is producing excess power, it will automatically feed the power out to the National Grid, and you'll get credited for your contribution via your power company. It has never been such a good time to install PV. Do PV cells work in cooler climates? Actually, photovoltaics work more efficiently in cooler temperatures. Degradation of the panels occurs much quicker in hotter climates, just like redlining your car engine will reduce its lifespan and efficiency. How do photovoltaic systems work? PV cells are bombarded with photons during daylight hours. Electrons are created. The Inverter switches the resulting current from AC to DC. The power will go to technology in your home first, then battery storage. Electricity generated will be recorded in the management system. What roof orientation is best? Most homes are suitable with a South/South East/South West facing roof space. No planning permission required. How much solar radiation in the UK? The UK receives 60% of the sun's radiation compared with the equator. Each square metre of your roof receives between 900 to 1,400 kWh annually. How much will a system generate in the UK? A system will generate approximately 900 kWh/year per kW installed. Thus, a simple 1.0 kW system will provide around 750 kWh per year, and a 5.0 kW system produce's about 4,500 kWh. How much will an installation cost? 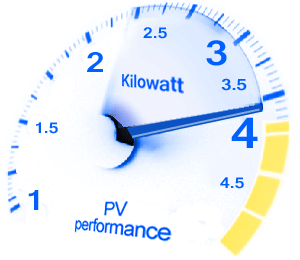 The cost of a PV solar panel installation depends on several factors but usually based on system size. A consultation appointment can be arranged to give options and prices. Are PV solar panels feasible? Your yearly electric bill x 30 years (panel lifespan). +3% (average yearly inflation) equals your future energy costs. Now compare this figure to the cost of PV and accompanying technologies. (This simplistic equation doesn't take into account any future energy price rises (If the last fifteen years is anything to go by, then future-proofing your life from political-stupidity is a necessity, not a luxury). Can PV heat my hot water tank? PV-to-hot water converters heat traditional hot water tanks by using daytime solar-generated electricity redirected to the heating coil. This device eliminates the need for your boiler to heat water. Installing DIY solar panels can work out cheaper. However, installations must get certified by accredited MCS-installers only. DIY PV solar kits are available to Part P electrical qualified. Although PV-arrays take a lot of roof space, most homes in the UK are suitable. Additionally, they can be ground-mounted A-frames if a roof is unsuitable. Any excess electricity produced will be directed out to the National Grid, and you will be credited accordingly (if battery storage is not present). Any deficit between in power generation automatically draws from your electricity supplier as per usual. No planning permission is required unless on a listed building or conservation area. No maintenance is required because PV is a 'solid-state' energy conversion process. Fitting costs account for 55% of the final installation. Do photovoltaics work on cloudy days? This answer depends on the density of the cloud. In average cloud densities, the sun can penetrate. With very, heavy dark, dense cloud cover, probably not. As an example, use a solar-powered calculator, and it will work fine. Can I sell my surplus energy? Yes, feed-in tariffs (Clean Energy Cashback Scheme) will credit you. Will fitting have a substantial impact? Once installed on the roof, the internal components don't take up much space inside. The full installation process is complete within 3-4 days. All MCS-installers are polite, clean and tidy. What PV size system will I require? Sizing requirement depends on your consumption rate, roof space and your budget. Various options are available to suit different budgets such as typical 2.0, 3.0 and 4.0 kW size systems. How long does a PV system last? Photovoltaics installed in the 1960s are still working today. Degradation is minimal consideration when choosing a system. Monocrystalline solar panels still have an 80% generation capacity after 20 years. PV panels today are coated with a microscopically thin layer of titanium dioxide during manufacturing. When ultraviolet light falls on the glass, the coating reacts with organic matter to break it down. As the Mars inter-planetary rovers, Spirit and Opportunity demonstrated perfectly, dirt and dust find it difficult to attach permanently. Helping people recognise the futility of Switch N' Save. Recognising PV and EV's work brilliantly together. Our enthusiasm grows alongside global demand. Simply, decades of freedom from geopolitical stupidity. We make installing as comfortable as possible.